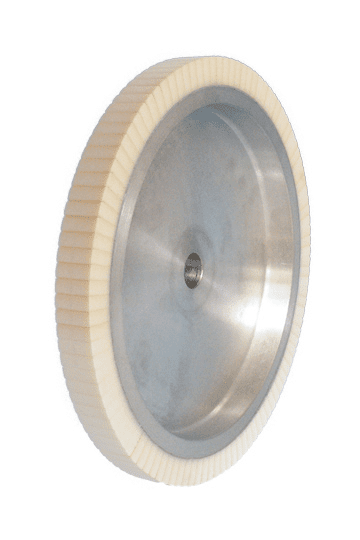 As the name indicates, the aluminium hub of the contact wheel FAPI-VUS DENSE is coated with dense adjoining lamellae of foamed up Vulkollan®. The length of the lamellae of foamed up Vulkollan® can be varied depending on the application (standard: 20 and 35 mm). 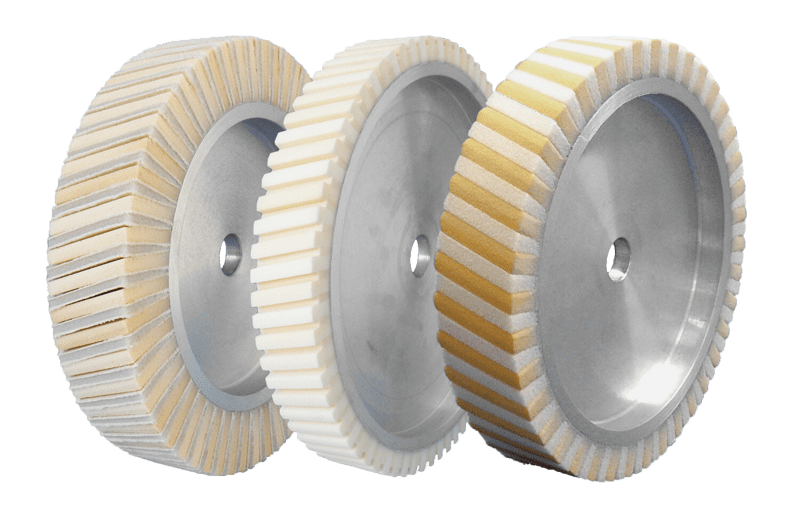 The lamellae of foamed up Vulkollan® provide the contact wheel with a “running cushion” with which a fine finish is possible especially when working on (strongly) cambered and profiled pieces. The coating adapts to every workpiece to be found. In addition, the contact wheel FAPI-VUS dense contributes in large measure to abrasive belt cooling because the spaces between the lamellae dissipate the heat. Because of these outstanding properties, contact wheels of the FAPI-VUS – series have proven themselves in the market over decades. Contact wheels FAPI-VUS DENSE are used in particular to achieve a high-quality finish on heavily profiled or heavily rounded workpieces in a very short time. The hardness of lamellae of foamed up Vulkollan® coating can be differentiated into three levels. The range extends here from a soft lamellae of foamed up Vulkollan® coating with 25º Shore (A) to a hard lamellae of foamed up Vulkollan® coating with 45º Shore (A). The right lamella hardness always depends on the individual application.